Castolin Eutectic, based in Switzerland and with U.S. offices Menomonee Falls, WI, has introduced two new maraging-steel welding electrodes, EutecTrode XHD 6860 and 6855XHD. Noting that maraging steels were first developed in the 1960s as high-strength construction steels for aviation and space technology, their comparatively high toughness levels at maximum tensile strength also make them useful in the tool-and-die manufacturing industry. 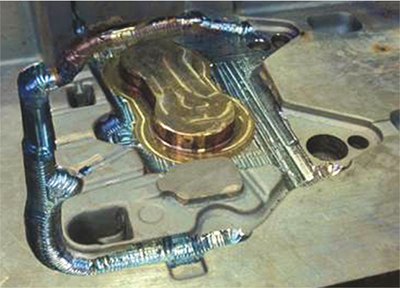 Among the advantages of the EutecTrode XHD 6860 and 6855XHD welding electrodes: a smooth, regular weld surface requiring minimal machining; low-temperature ageing treatment that eliminates quenching defects and distortion; retention of aged hardness at high service temperatures; and good weldability without preheating. Material properties of XHD 6860: 40 HRC as-welded hardness, 60 HRC aged hardness.